Mold remediation is the safe removal and cleanup of mold contamination from an interior environment by a trained and certified professional. Surface and air cleansing of contaminants in the environment is also performed by Indoor-Restore Environmental Services, as well as treating the building to prevent future contamination. This is all executed in a controlled environment by trained mold remediation technicians using industry-standard equipment and proper treatments specialized for each situation. Prior to the execution of mold remediation, the contaminated areas are quarantined from the rest of the home or building to avoid cross-contamination of unaffected areas. A customized, prewritten mold remediation procedure is conducted that may require removal of building material such as walls, ceiling, or flooring due to elevated levels of contamination and/or destruction from the water damage or mold. Remediated areas are then treated to prevent the recurrence of contamination. Insurance Claims – For prompt resolution, we can work directly with your insurance provider to assist with filing an insurance claim. Many states allow you to choose the company who performs the remediation instead of the insurance provider. 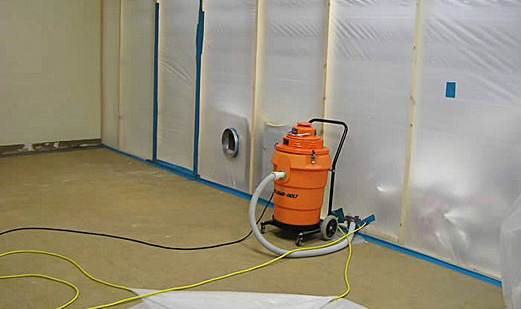 Mold Remediation Containment – Protective barriers are constructed to prevent cross-contamination of unaffected areas of the property, if the risk is present. Controlled Removal and Disposal – According to mold remediation protocols, contaminated materials that cannot be cleaned will be safely contained and removed. These materials may need to be replaced to prevent contamination from recurring in the area, and include: carpet and pads, equipment, clothing, furniture, drywall, and other materials. Air Treatment and Purification – Throughout the remediation process, it may be necessary to install and run air circulation, dehumidification, and air purification machines for additional cleaning of airborne particulates such as dust, allergens, and mold spores. Deodorization – Controls and neutralizes odors that may result from mold and water damage. Contents Cleaning & Decontamination – If contaminated or damaged items are salvageable, we can clean contents of your property. These typically include clothing, documents, furniture, electronics, toys, and other items. Items to be disposed of will only be done so upon your consent. Anti-fungal Treatments / Disinfecting – Succeeding the removal of mold and contaminated building materials, special treatments are applied to those areas to prevent future contamination. Reconstruction/Restoration – Through reconstruction efforts, the property will be repaired and restored to its pre-damaged state after the remediation and decontamination process is complete. Off-Hours Service – We know that everyone has their own schedule, and that you may need concerns resolved promptly outside of our normal business hours. We can adapt to your schedule to efficiently resolve water or mold damage issues at your property. Indoor-Restore Environmental Services delivers a 10-year warranty on all mold remediation services we conduct at your property. This warranty assures that mold will not recur to areas remediated by our company. We do this to provide all of our clients with the peace of mind they deserve, that the efforts executed by our technicians are of the highest standards and quality. At no cost to you, Indoor-Restore Environmental Services can prepare a remediation and repair estimate for any contamination or damage situation at your property. To find out more, contact our experts at (866) 358-3838 or submit an online Service Request Form.